Why Are There a Few Blocks On Shore Road Without Apartment Buildings? 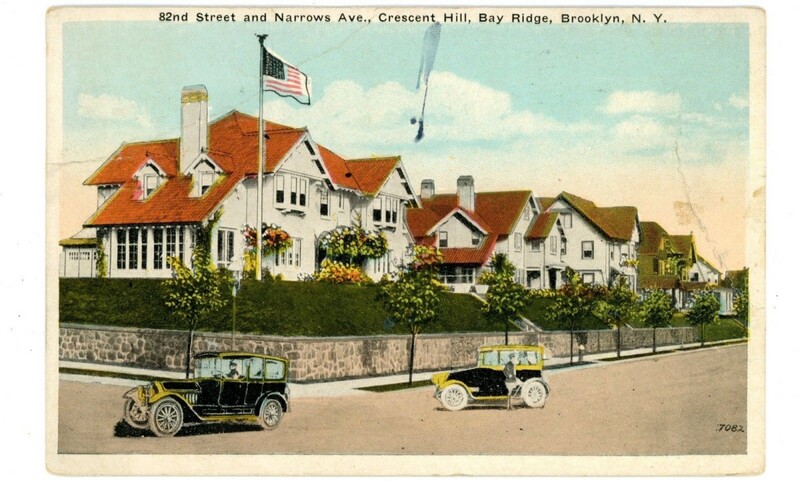 But two-thirds of a mile were spared; twelve blocks of Shore Road, from 75th Street to 87th Street, are still occupied by freestanding houses—not coincidentally, just slightly larger than the borders of Crescent Hill, a tony former subdevelopment in Bay Ridge where the area’s most prominent families settled in the first half of the 20th century: the van Brunts, the Hinsches, State Senator Cronin, the Schlegels, Townsends and Cocheus. The character of these streets, lined with large and attractive freestanding homes, was intentional and carefully planned. 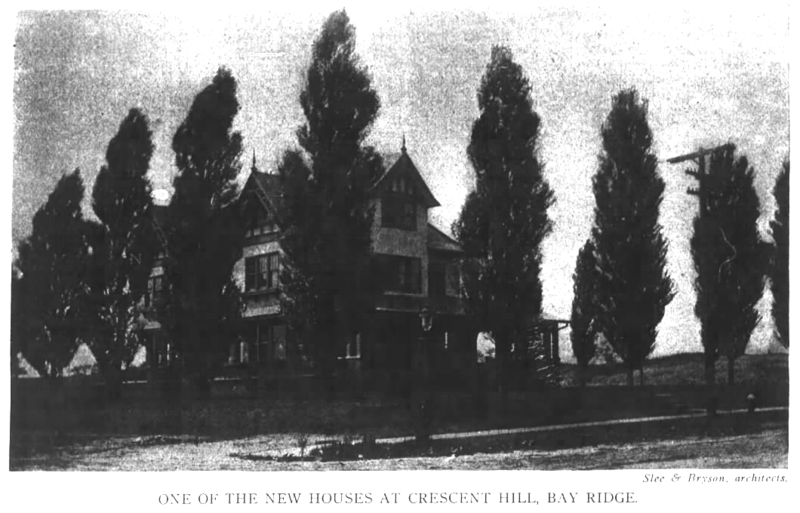 “All who have visited the Crescent Athletic Club’s beautiful grounds at Bay Ridge, or driven an auto along the Shore Drive, or sailed down the Narrows, will recall the broad, level-topped hill fronting the Drive just north of the club grounds. 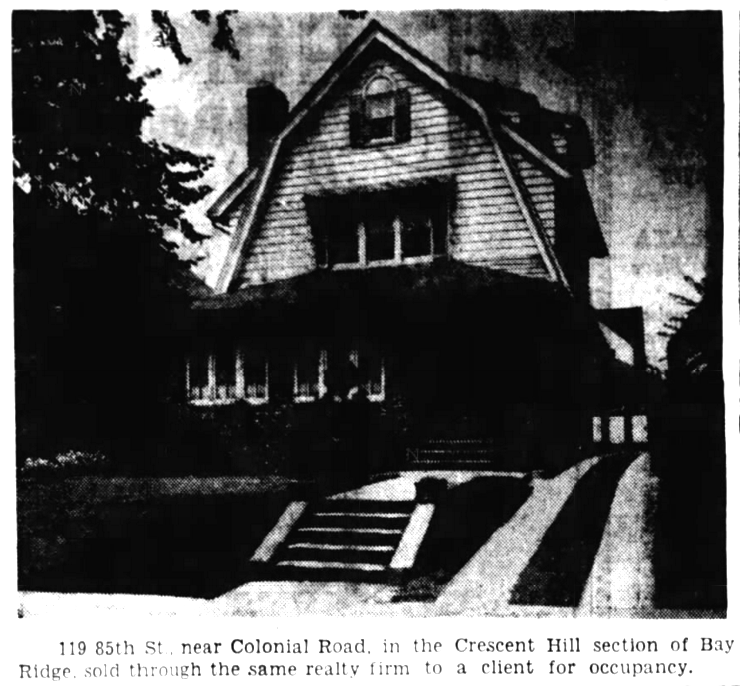 This is Crescent Hill,” the president of the development company, William H. Bonynge (a prominent New York lawyer), wrote in Brooklyn Life in 1908. A level plateau containing about five hundred city lots fronting the Drive at an average height of forty feet above the water, commanding a sweep of the entire upper bay to the Battery on the north, and of the lower bay to the Navesink Highlands on the south, with Staten Island and the Narrows in the immediate western foreground, provides a panoramic view of the natural beauty and commercial activity, not surpassed anywhere. 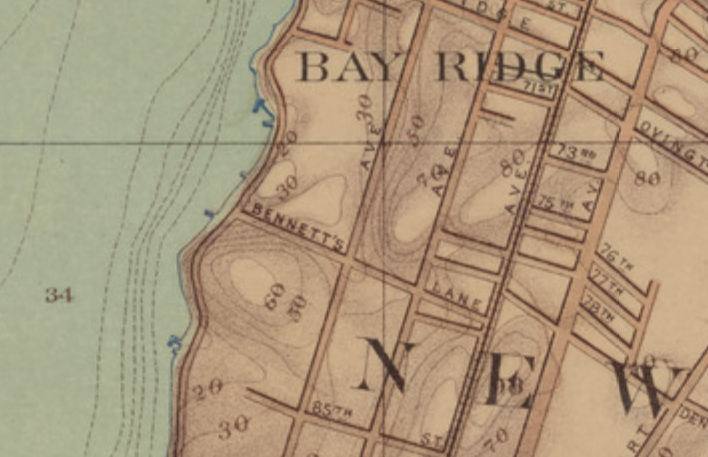 When you add that the city has completed plans to expend $4,000,000 in making of the entire Bay Ridge water front along the Narrows a gardened parkway entrance to the upper bay, upon which no commercial wharf or business structure can ever encroach; and that the completion of the Fourth Avenue subway [in 1916] will bring this delightful region within twenty-five minutes’ travel of the business center of Manhattan, it is not at all astonishing that shrewd real estate investors have turned their attention to Bay Ridge with full recognition of its enormous possibilities. In the vanguard of these wise ones is the Crescent Hill Improvement Company, which has purchased the major part of the plateau above described and, uniting with other owners of adjacent property in heavily restricting the entire tract, is now engaged in the active improvement of the property under a comprehensive plan. When I first saw the property there were but two thoughts in my mind: wonder that such a tract had been overlooked so long, and a determination to get hold of it at once, if possible. I took some friends down the next day, and this company and its purchase was the result. We realized at the outset that we had an unusual property and should deal with it in a manner befitting its possibilities. The very first thing, of course, was to put it all under high restriction and guard its approaches against undesirable development. We spent a year in negotiating further purchases and contracts with adjacent owners to accomplish this result…We are laying out the building sites in plots on First and Narrows Avenues…Other features of our development plan are the preservation of the present hill contour, with terraces to the street levels, and the location of plot boundaries in such a manner that the houses when built shall not front directly opposite each other—thus affording a more extensive view to each and giving a greater aspect of openness to the entire property. The Shore Drive is conceded to be as attractive as the Riverside to-day; five years hence it will far surpass it. 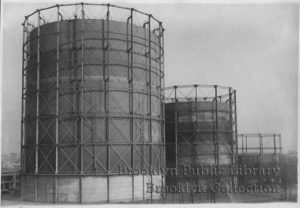 Five years hence the Bush chain of immense factories will be operating, the great market at Thirty-eighth Street doing business, the series of big city docks well under way, the Pennsylvania’s freight terminal completed, and South Brooklyn a humming hive of industry. 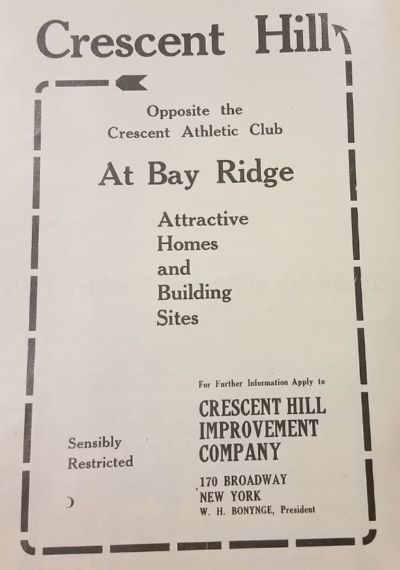 The Bay Ridge section will be the natural home-site for the owners and chief men engaged in these industries, as well as of hundreds of well-to-do business men whose offices are in lower Manhattan; and, of course, we think that Crescent Hill will be the “show place” of Bay Ridge. Looking east up 82nd Street, from Narrows Avenue, ca. 1920s. These houses still stand. Such restrictions were novel. Most developers in this area at the start of the 20th century purchased collections of lots the size of a block or less and built identical row houses, or apartment buildings; such structures define much of the architecture above and around Third Avenue. 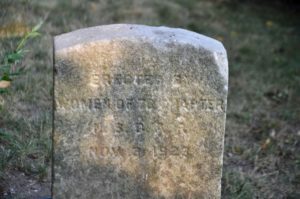 But here was something defiantly different, with men of means intending to preserve the exclusivity of the Shore Road section as it had been in the Gilded Age—but in a new way, for a new generation. Via Brooklyn Eagle, 1936. The house still stands. 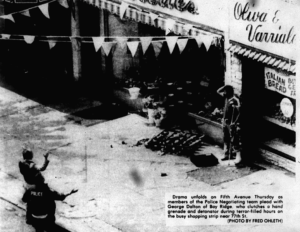 Still, the development’s sense of itself as a distinct community within the boundaries of Bay Ridge persisted. Crescent Hill held out. 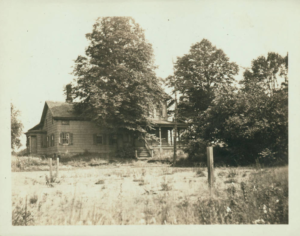 Changes to the zoning laws were seriously considered in 1927, when the property owners south of 92nd Street advocated for a change allowing apartment buildings. 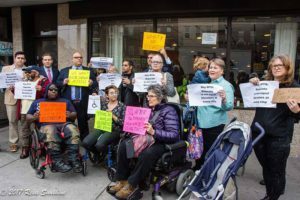 However, “Opposition is manifested to a pronounced degree by the residents of the neighborhood from 75th st. to 82d st., west of 3d ave.,” the Eagle reported. Philip V. Manning, an attorney, resident of the section for many years, believes “that the character of this neighborhood is so well established and the property now available for building purposes so scarce, that it seems downright folly to attempt to include this section, possibly one of the finest residential sections of the boro, within the area petitioned to be changed. This fight continued for decades. 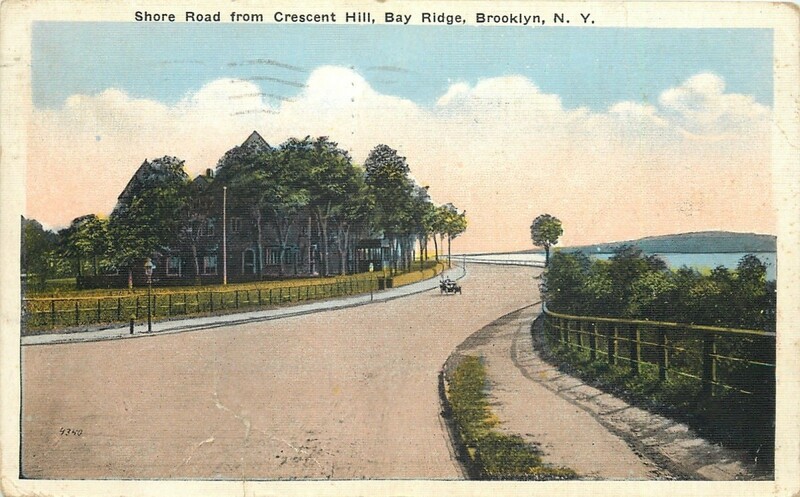 “From 74th [Street] to 86th, the Crescent Hill section, the Shore Road might well be left as it is. It is an area of beautiful rich, rolling country, with homes costing from $9,000 to $100,000 [$150,000 to $1.7 million, adjusted for inflation],” Frank Matrunola, then a prominent local realtor, told the Eagle in 1940. The rest of Shore Road had either gone, or was going, to apartment development. 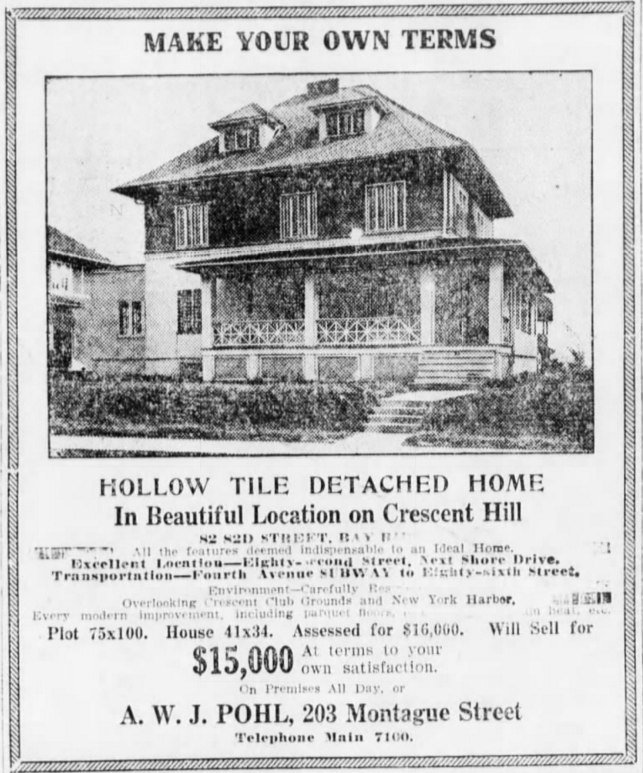 But fatalistic Creahan was wrong—the Crescent Hill section stubbornly resisted, and its homes were never converted into apartment houses. Today, much of the old Crescent Hill section is zoned (maps here and here), unlike the areas around it, as R2, which “is limited exclusively to single-family detached houses,” according to the city. The Crescent Hill distinction faded away, but not its ethos. 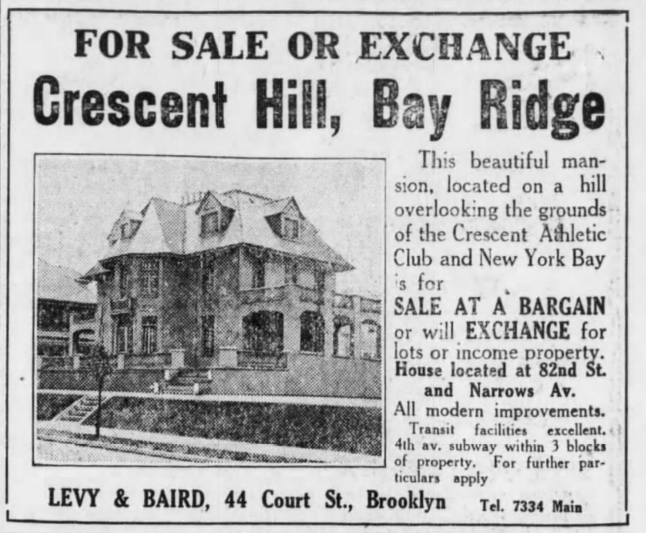 I don’t mean to disparage apartment living; most of us, I’m sure, can’t afford to buy a house in Bay Ridge, especially these days, with the real estate market so out of control. And a diversity of housing stock is essential to an economically diverse community. But I’m glad that a segment of Shore Road was more or less preserved. My “ideal community” would disperse apartment houses more evenly rather than clump them together. Apartment building upon apartment building can have a dehumanizing effect and restrict walkability—not literally, but by creating an inhuman scale that discourages perambulation. 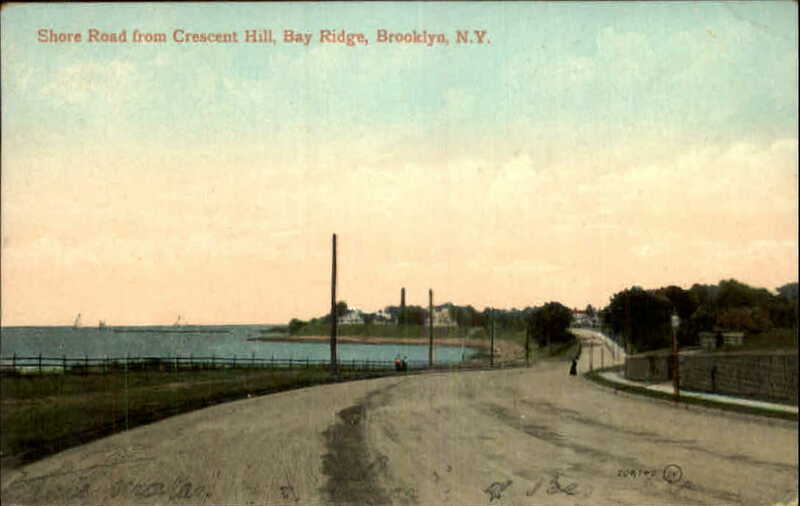 I could walk all afternoon up and down every block in the old Crescent Hill section; I’d rather bike past the south end of Shore Road, just to get it over with. But we don’t live in my “ideal community,” and certainly not in one that was carefully planned to maximize flâneurability; Bay Ridge was haphazardly developed by myriad men with innumerable interests. So I’m grateful that one small group held out and preserved some sense of the aesthetic character of the old community in one small corner of it, even if it was ostensibly for the wrong reasons—not to preserve, but to exclude. The houses that stand there today are hideous attempts to replicate Italian villas and couldn’t be less desirable.